This article appeared in symmetry on Oct. 22, 2013. Bring hundreds of smart physicists together and what do you get? Lots of questions! This summer, more than 700 particle physicists from nearly 100 universities and laboratories across the United States came together on the University of Minnesota’s Twin Cities campus for the Snowmass Community Summer Study meeting. There, they discussed the decades ahead in US particle physics, carefully considering the next steps in their studies of energy, matter, space and time. 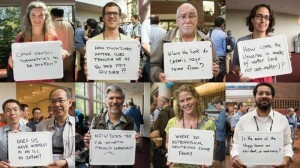 During coffee breaks, symmetry asked attendees to share open questions in particle physics. Here’s a sample of what particle physicists think about and what they hope to discover in the coming decades. View an image gallery of particle physicists asking their most pressing questions.